In the style of films like Scary Movie , Harry’s Hotter at Twilight is a hilarious stage parody mash-up of the Twilight saga, Harry Potter , Lord of the Rings , and a dozen other pop-culture icons from the last decade and beyond. 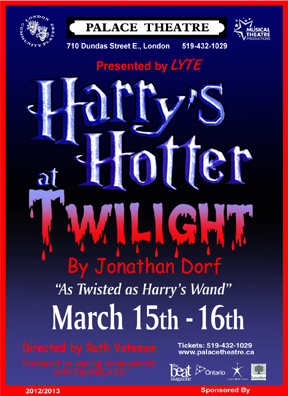 Get ready for story as twisted as Harry’s wand as you follow the characters of Twilight and Harry Potter in their intertwining quests for creepy human/vampire/werewolf love and the defeat of the ultimate evil in this uproarious send-up. When the town of Spork — and ultimately the whole world — is threatened by the army of bloodthirsty vampire Euphoria and the nefarious Fine Diner (He who shall not be named *wink wink) and his evil cohorts, it’s up to the Twilight and Harry crews, with help from a few stranger than fiction friends, to put aside their differences — and logic itself — to come together to defeat the growing evil and prove once and for all that the 4th wall is over-rated.